Last night's St. John's-Notre Dame bout at The Bra was an easy win for the 24th-ranked Irish, but it came at a cost: a Senior Night scuffle between ND's Cameron Biedscheid and SJU swingman Sir'Dominic Pointer resulted in both being ejected for fighting and a mandatory one-game suspension. That's big for Notre Dame, as they'll be without Biedscheid for this weekend's regular season-ender at Louisville. 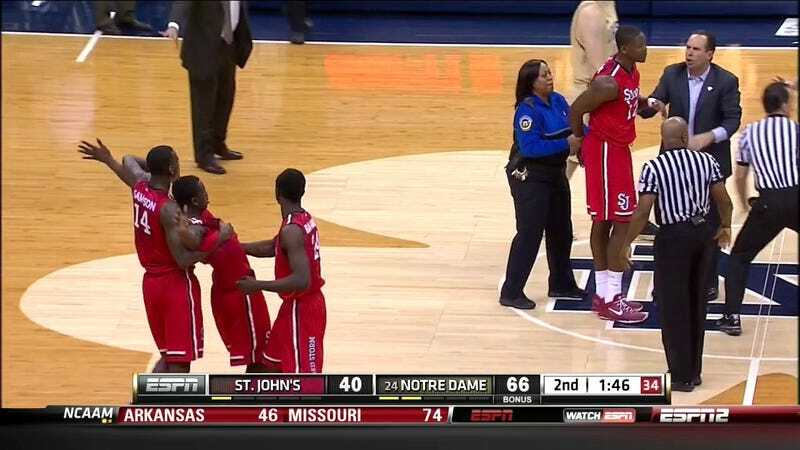 Red Storm big man Chris Obekpa got the worst of it in the moment, though, when authorities took him into custody—briefly.